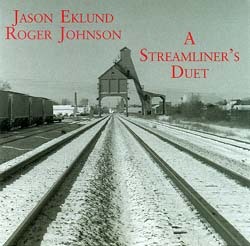 Jason Eklund/Roger Johnson "A Streamliner's Duet"
Widely recognized as one of the country's most talented singer/songwriters in its crop of young blues/folk performes, Eklund (with two prior releases on Flying Fish) is a raw force to be reckoned with, a playful conscience with a guitar, reminiscent at times of Woody Guthrie and other great American storytellers. Eklund and Johnson joined forces to create this rough-and-ready theme project, recorded over a few days in late 1995. This feels-like-you're-in-the-next-room set runs from blues and folk songs to ragtime instrumentals to spoken word soliloquy. A heartfelt recording with a life of its own.